Suggestions for a Image processing setup with FPGA and FMC. 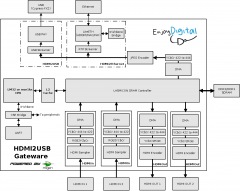 Hi, I'm using the dvi2rgb/rgb2dvi cores (latest repository version) to make a simple passthrough in the FPGA and have huge issues with the EDID memory. Has it been confirmed at some point that the default 720p edid settings work properly with a GoPro Hero5 camera? I tried loading the default EDID, a properly cooperating monitor's EDID, prepared numerous EDIDs myself - every single one seems to fail so the camera is setting itself to the lowest supported resolution. Had a go with a Panasonic DMC-G3 camera too but it behaves the same way. Both sources work properly when connected directly to the monitor. The EDID values are being read properly, this has been verified on an oscilloscope (the camera seems to be reading the 128 edid bytes twice though). The dvi2rgb IP core seems to take anywhere from 5 seconds to 20 seconds to acquire synchronization and display incoming HDMI data. The datasheet says the process could take up to 1 minute. The pixel clock achieves lock quickly, it's just the data/syncs that takes some time to appear. I hate to complain, because the core is provided free of charge with the Nexys Video card, and seems to work quite well otherwise, but Is there any way to speed up the acquisition time, or perhaps in a future update?